This fall I've been consumed with the whole process of finding a school for Z and O. They're spending the next, oh, six or even nine years there, so it behooves us to pick a solid one. The public schools that we've toured are pretty darn swell. We looked at one top SF public and came away underwhelmed. It's not to say it didn't deserve its good rep, but in comparison with others we've seen, it was comparable to a host of other district schools. We have one that is our top choice - we plan on eventually moving to that neighborhood, the principal is down to earth and straightforward, the parents who led the tour we were on were also down to earth, and the kids looked like they were having a good time. So we'll turn in our app with seven choices and try to forget about the process until late March when the results roll in. We've toured four private schools as well. They also have their strengths, and, to be honest, they will be a better fit for the kiddos in the long run. However, the admissions process is competitive, based on a number of factors including parent interviews and screening of the kids. It's more personal and, as a result, generates many feelings of insecurity and inadequacy, at least on my part. We'll do our best to provide thoughtful answers to the essay questions, be ourselves at the interviews and tours, and submit our apps, then wait for the March letters. All in, we're applying to 11 schools - 11 schools that'll work for our family. It's an incredibly stressful experience; even though we've done our research and due diligence, what if we're completely wrong? Part of the whole torment of parenting is that feeling that somehow you're going to screw things up no matter what your good intentions are. I took Z to a family open house at one of the private schools. It was two hours; I fully expected to stay a hour tops. But Z had a ball. We hung out in the kindergarten classroom for a good hour, took a snack break, then headed up to the library. We didn't even hit the art room (I'm starting to suspect that she, like me, likes to create in solitude) and revisited the kindergarten classroom to close the day. I rarely get to see her in action in this kind of setting, and I have to say it was pretty neat to see her pretend play with these old school Fisher Price Little People toys. 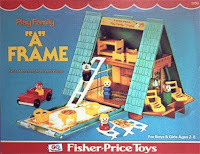 We're talking the ones from the '70s, like this a-frame house that I had when I was not that much older than her. Now I kind of want to find one just to have. I know, good luck with that, right? I bet you can find those Fischer Price toys on eBay! dude, they're selling them for $40! this needs to be a $10 garage store or thrift sale find, otherwise it's not so fun.